No matter where I go or who I meet, I’ve noticed one thing — people really do love to learn about food and want to know more about health. But unraveling complex diets, understanding the intricacies of nutrition, and exploring the ever-changing world of food and medicine can be complicated. Yet I’ve learned that making small changes in your diet and lifestyle can be incredibly manageable and easy, even for people with the busiest schedules. Some of the small changes that I made in my own diet — including the way I view food — have brought about drastic changes in my weight, health, and overall happiness in life. SkinnyChef.com has always been my way of sharing personal health solutions for busy people. Coming from my own experiences growing up in a family who still struggles with obesity and overeating, I know that living healthy may seem like a difficult path. The Ask Skinny Chef forum is a place to ask all those questions you’ve had about health and food, gain support, and increase readers’ excitement about healthy eating. Ever wonder about those food myths and if they are really true? Have a healthy cooking question? Now’s your chance to find out. Subscribe to the Skinny Chef newsletter to receive updates about healthy living and health foods trends. Learning about food and health is fun. I eat healthy, why can’t I lose weight? What am I doing wrong? I thought I’m supposed to count calories? I love eating out, how do I stay healthy? I don’t know how to cook, how can I start eating healthy? Didn’t see the answer to your question? Ask the Skinny Chef! I’m not a diet doctor or a nutritionist, but I get this question all the time. It’s a tough one to answer since everyone is unique. We all have different dispositions, body shapes and dietary needs. But one most common mistakes people make is eating the the wrong portion size. Check out labels and find out how much a serving is – usually a package contains 2 or more servings and each serving is about 1 cup that’s roughly a small coffee mug-full. As you stroll the aisle of your local grocery store, provide yourself with some excellent reading material. Glance at the labels of the products and items you buy every week. After 10 minutes, you’ll know if you are eating more than a serving size according to the package. Find out more about the perfect portion. Portion size becomes even more important when you eat out. For example, most restaurants and fast food places serve high calories dishes that are also 4 to 8-times the portion size you should be having. So if you normally have a cup and a half of plain cooked pasta with fresh veggies that restaurant pasta dish packs on 4 times the pasta plus loads more calories and fat with the sauce. So that means that one meal might be half calories and 75% of the fat you should have in an entire day. Sot . You should have an idea of how many calories you are taking in. The more you eat out the more difficult that becomes. Eating at home is the easiest way to control what you eat and how much. It’s time consuming to count calories, that’s where portion control becomes key. You can think of your body as a suitcase and clothes as calories. Everyone has a different size suitcase but we all know that if you back too many clothes, you suitcase is bound to bust. Wanna to find out how many calories you should be eating a day to maintain or loose weight. Try out the USDA’s super easy calorie calculator. Over 50% of all American eat out everyday, several meals a day. I love eating out too! Restaurants can be a fun way to catch up with friends and experience new foods and flavors. Since I view it as a treat, I limit my trips to local pubs, delis, and fine dining restaurants to twice a week. It’s hard to know exactly what is going into your meals. After working behind the scenes myself, I can tell you that most restaurant meals use 3 to 4 times the amount of fat, salt, and cheese than a home cook would use to prepare the same dish. The portion sizes tend to be 3 to 4 times the amount you should eat at one sitting. I know I always feel tempting to keep eating long after my stomach is full. If you must eat out more than twice a week, try sharing your plate and order a plain salad on the side to add some veggie power to your meal and help to fill you up with much needed fiber. Skip items that are breaded or deep fried, items listed as crispy or au gratin are usually high in fat. Feel free to ask the waiter about the preparation. I almost always pass on desserts – or sneak a bite from my husband’s plate. If you have to have dessert opt for fresh berries or a cappuccino with skim milk and cocoa powder if you want a sweet, light ending to your meal. Simple, healthy cooking is easy and fun – believe me, you can learn! If you don’t know how to cook fish or meat, start simple by preparing salads and healthy dips at home. If you can use a blender you can make a healthy dressing, dip, or casseroles or make smoothies for starters. Everyone can boil water — so make some whole grain pasta and top it with low-cal, store bought tomato sauce and stir in steamed broccoli or spinach. If you must hit the take-out window, add a handful of raw veggies to every take-out meal and drink water instead of high calorie sodas and gourmet coffee drinks. Take care with the portion and check-out the nutritional information on-line. Most popular take-out chains list the nutritional info for each item on their menu. If it’s your favorite mom and pop place, order one dish, split it or eat half, and half some veggies or a low-fat yogurt on the side. Hello Jennifer, it’s your knife wielding friend from ICE. It’s so kewl to see what you’re doing and what you’re up to. Believe me… it’s no surprise whatsoever. I’ve been doing the world with a hand full of knives, setting world records and having a ball, to say the least. You might want to watch the first 4 or 5 weeks of America’s Got Talent, season 2, premiering this tuesay, June 5th at 9 PM on NBC. All I can say it that I’ve been through the Hollywood and Vegas “Boot Camp” rounds. Beyond that… it’s a secret! I love cheese. The problem is I think I eat too much of it. Is one cheese better than another in terms of nutrition and health? Thanks so much, Jennifer. By the way, I love your recipes! Great hearing from you and yes I’ve been following your career- spectacular!! I knew you were a great maestro the first time we talked about knives. Thanks for the all the good wishes and please stay in touch. I’m coo-coo for cheese and eat a little almost every day. Cheese is high in nutrients, in particular protein and calcium, which is very important for active young women who want to protect their muscle mass and bone density as they age. Other nutrients include phosphorus, zinc, vitamin A, riboflavin, and vitamin B12. Cheese has even been known to enhance tooth enamel. Women, 19 years and older, should be getting about 3 servings (3 cups) of dairy a day – but I suggest you stick to mainly low-fat dairy, including yogurts, skim milk, kefir, cottage cheese, as well as reduced-fat chesses. If you’re interested in learning more about international cheese and cheese making visit the experts at Murray’s. Bonus: They let you taste before you buy! I love your website, newsletter and recipes. On a personal note, I think you are way more talented than the Rachel Rays on the Food Network. My question is about carbs. I am allergic to dairy and I am not a big red meat fan. I get sick of chicken. So, I resort to eating carbs a lot. How much carbs is too much? Is it true that eating pasta for dinner puts weight on? And lastly, does eating sushi too much add pounds? Thanks again for all the great info and recipes. Keep up the great work! Kind words are food for the heart!! Ah carbs, there is a lot of confusion because of all the crazy fad diets out there. Basically, carbs exist in a lot of foods and are turned into sugar in our bodies for fuel. I suspect your question relates to high carbohydrate choices such as grains, bread, pasta, rice, and potatoes. Lots of my vegetarian and vegan friends have the same issue you are having with carbs when it comes to cooking something fast at home or eating out. In my case, at 5’2″ and 125 pounds, on a 2000 calorie diet, I should have between 6 and 8 ounces of grains each a day. 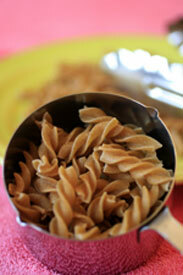 Just to give you an idea, 1 cup of dried pasta is around 4 ounces and one slice of whole wheat bread is about 2 ounces. The best way to find balance is to always supplement your diet with vegetables whenever possible. Snack on some raw veggies while you cook or while you are getting ready to go out to eat. Check out My pyramid to find out what your personal eating plan should be. Since dairy is not a possibility for you, I would also be concerned about your calcium intake. I’m not a nutritionist but I would still advise you to add other high calcium foods like broccoli, beans, such as black beans and soy, spinach, kale, and collard greens which would make a big difference. Other sources of calcium include breakfast items that are fortified like cereals that you can enjoy with soy milk, whole grain waffles, and orange juice. Always check the label before you buy to make sure they are fortified! To answer the last part of your question, eating pasta and rice at night may cause you to gain weight depending on how many calories and carbs you have each day and if you go over the limit. If you’re striving to lose weight, it is much better to have your starches (rices) and carbs (pasta) at lunch and enjoy low-fat protein and veggies in the evening. But again, when it comes to maintaining a healthy weight, you have to look at the big picture, your calorie and fat intake, how active you are, and how active your metabolism is. 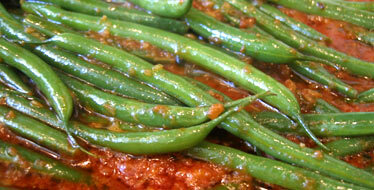 Hi, I am a vegetarian and cook Indian dishes with lentils, beans, vegetable and some times fish. Have u got any receipes or help? Just type in “vegetarian” in any of the search boxes or “fish” and the recipes index will show up for you search. So, the most important of all questions, can you make a chocolate raspberry torte “skinny”? I have been cooking for a while and started making dishes with quinoa. Is there a way to make quinoa into a risotto? I’d like to know the portion size for entree, main course and dessert at the fine dining restaurant. Could you please help ?. Portion sizes in restaurants do get confusing. Usually portion sizes in fine dining restaurants tend to be smaller but it depends on the establishment. I good rule of thumb is to think in coffee mugs. A regular, run of the mill coffee mug holds about 1 1/2 cups. So if you aren’t able to count calories, 1 1/2 cups of cooked pasta, enough to fill a coffee mug is about a portion. Of course when you enjoy meals out, you also have to consider fat content as well. Sauces, toppings, and glazes usually have a lot of butter and other fats added for flavor. When I eat out, I usually have a plain salad first to make sure I’m getting in my veggies and then enjoy half of my pasta. Makes a great lunch for the next day if it makes it past my husband! What a great website! So I’m curious as to how you lost your weight and how long it took? I want to chart my goals and progress. I’m a sugar addict and have lost on Atkins and kept it off, but crave fruit and veggies so I don’t think I could do Atkins again. Thanks! Sugar addict- I was the WORST when I was a teenager. I found that giving up my daily candy bar and the soda I drank on a weekly basis, cut hundreds of calories from my diet and my waistline. Cutting back on sugar will also help you to maintain a steady blood sugar level- avoiding those spikes that and make you feel tired after you eat a lot of sugar. Atkins can be rough on the body since you miss out on a lot of fiber and vitamins that veggies and fruit provide. 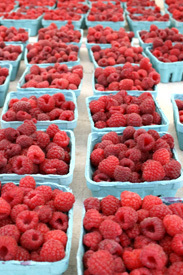 Try eating your fruit in the morning and skipping carb heavy foods at night , like tons of pasta and bread. Load you plate with steamed veg and low-fat sauces- that always helps me! Hello Jennifer, I’ve been enjoying your website for the past few days. I am also a Jennifer, short, in my thirties, a huge fan of yoga and married to a man who can eat almost anything. The first recipe I tried was your Coco Bats. I didn’t see any chocolate listed in the ingredients so I added a 1/4 cup of cocoa and when it seemed too dry I added a child’s size applesauce. The results are OK but not great. Do you have any suggestions? Hi Jennifer: Do you remember babysitting my daughters, Jessica and Kristine Schoch from Neville Island? Your stepmother told me about your wonderful endeavors. Kristine remembers when you used to play restaurant with them and create your own menus and meal names. I think I came across one of those menus once when I was looking through boxes. We are so proud of you and inspired by you. I want to go to culinary school. I love to cook and I love to cook food that is healthy for me. My only queston is will I gain weight in culinary school. I have worked so hard to lose over 30 pounds and keep it off but I love to be in the kicthen and would love to do it for a living. I do have an active life, I love to work out and I make good choices as far as food goes everyday. So can you help. Great question Patie! It’s true that fat carries flavor and adding extra chicken fat would of course make a soup that is richer and has a more complex mouth-feel. Skimming it later would not necessary remove all the fat that was added. Skimming is an inexact process and only removes some of the fat that rests on the top of the soup. In terms of flavor, yes I would imagine it would make it more flavorful but I would not want to add more fat to a soup that is pretty tasty and totally healthy already, especially since you are added saturated fat that can cause coronary heart disease. Hey Jennifer I was just wondering if you had any comments or helpful thoughts on not gaining weight in culinary school? I love to cook and but I love my health more and I just lost 30 pounds. I don’t want to gain it back in school but I want to be a chef. That is my passion. I wrote you before but I didn’t you didn’t write anything back. So can you help me? I really would like it if you could. Hey Jennifer. I just have one question. I love peanut butter and I do eat the natural kind but I was wondering how much of the peanut butter you can eat a day? Is it just 1 tablespoon or can I have 2 tablespoons a day and still stay at a healthy weight? You said you have read many ayurvedic texts on health and diet. Do you have any that you recommend? I like “The Book of Ayurveda” by Judith Morrison. She really breaks it all down and makes the information about the dosas, diet, and lifestyle easier to understand. You can also learn more on http://www.ayurveda.com. I love the web site and also love some of the recipes that I have tried from you. My question is about cookies. Every sunday I like to have fresh baked chocolate chip cookies but I go and buy them from whole food market. I was wonder how to freeze cookie dough if I make up my own? Also when I want to use just a little of it do I cut some off and let it unthaw or just go right a head and bake it? Thanks for the help and keep up the good work. I love the healthy eatting. I have a recipe for some muffins and it calls for 1/3 cup of butter. I want to make them healther and I no I can use canole oil instead of butter but my question is how would I replace some of that oil with applesauce or something else? I would like the recipe that you made on the CBS early 3/30/2008 Sunday morning program with Tony the Grocer. It was tomatoes, etc. over pasta and a recipe for asparagus. I see your question about slow cookers. It inspired me to write a blog about crock-pots. You can check out all the recipes on the webcast page for the segment, they’re listed on the lower half of that page. Per your question about the muffins- 1/3 cup of butter isn’t that much for the entire recipe, but if you want to make it even healthier, I’d replace it with trans-fat free tub margarine (so there is no saturated fat). I’d skip the oil since it make change the texture of the muffins and make them heavy. Will you be writing your own cookbook sometime soon? I love to pick out my recipes from a book and find it less enjoyable getting them from my computer. Thanks for your note! I do have a cookbook in the works. I’ll let you know when it’s scheduled to come out. I’m trying to get a copy of your chicken fajita recipe with grapefruit juice as an ingredient. I thought you had a copy of this in a magazine recently. I somehow misplaced my copy. My name is Lori and my E-mail website is [email protected]. Thanks for your assistance with this, I really appreciate it! I was wondering if you have to be your ideal BMI to start doing Yoga or if you can start when you are classified as overweight by your BMI? Hi there, I just read your last email and saw that you’re from PA. I’m going to be planning a wedding there(Gettysburg area) in October 2009. I know that it’s about 4 hours away from Pittsburg but do you know of any vendors in the area that are fun? I know you’re more mainstream than these kind of questions but figured I’d give it a go if you have any friends or favorite businesses in the area. Thanks so much & love your site! What do you recommend as far as Diet Powders or diet liquids in the can. I heard today that one company was recalling their diet liquids in the can. Thanks for your question, I think a lot of people out there including myself in my teenage days have tried diet powders. I don’t recommend them because most are loaded with preservatives, artificial colorings, and don’t taste very good. I make my own “protein shake” for breakfast with real ingredients like 1 cup of plain yogurt or kefir, a banana or cup of fresh or frozen berries, 2 ice cubes and 1/2 of skim milk, and one teaspoon of granulated sugar or honey – then just blend it up. Describe heat transfer in cookware and identify which type of metal is the best all around choice to cook with. Interesting question! That’s a super broad topic, and it depends on the heat source, direct, baking, as well as cookware on the grill which I have experimented with. Could you give me more specifics? In terms of stove top cooking with gas, my top pick it stainless steel, I use Allclad skillets and they preform the best of any skillet I’ve used and I’ve had mine for over ten years. Stainless steel line copper pans are great too, although the copper does need a lot of upkeep so I go for the all stainless steel.